Here at Diabetes Flashpoints, we’ve written in the past about how certain features of a neighborhood’s physical landscape — such as walking trails, or a high density of walkable destinations like restaurants and shops — can either encourage or discourage physical activity. 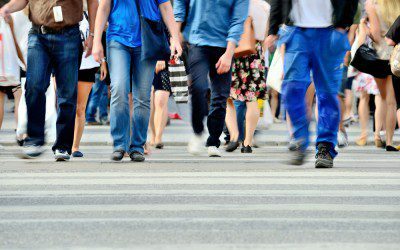 Now, a new study of several different cities shows a wide range of physical activity among residents — and shows what features of neighborhoods tend to lead to higher levels of physical activity. Researchers measured participants’ physical activity by having them wear an electronic monitor for several days. They also analyzed several different features of neighborhoods where the participants lived: residential density, number of street intersections, public transit density, number of parks, mixed land use, and distance to the nearest public transportation option. The first four of these six factors were found to correlate significantly with physical activity, and in a linear fashion — the more parks or public transit stops in their neighborhood, the more physical activity participants were likely to get. As noted in a HealthDay article on the study, participants got, on average, 37 minutes of moderate-to-vigorous physical activity each day. But this number varied widely from city to city and neighborhood to neighborhood. Residents of Wellington had the highest average amount of physical activity, about 50 minutes daily, while Baltimore residents had the lowest amount at about 29 minutes each day. And participants who lived in the most activity-friendly neighborhoods got 48 to 89 more minutes of physical activity each week than those in the least activity-friendly neighborhoods — a much larger difference than many studies have found in the past. Of the four factors the study found to have an effect on physical activity, the one with the most dramatic impact was residential density: Residents of the densest neighborhoods got, on average, 89 more minutes of physical activity weekly than residents of the least dense neighborhoods. The next most important factor was intersection density, with residents of neighborhoods with the most intersections getting, on average, 35 more minutes of activity weekly than those in neighborhoods with the fewest intersections. Residents of neighborhoods with the highest density of public transit stops got an average of 24 more minutes of activity weekly than those in neighborhoods with the lowest density of stops, and residents of areas with the most parks also got an average of 24 more minutes of activity weekly than those in areas with the fewest parks. These factors had a similar effect on physical activity throughout the different cities in the study, despite the wide cultural differences between the cities. What’s your reaction to this study — do you think your neighborhood would score highly in residential density, intersection density, transit stop density, or number of parks? Do you think these factors affect how much physical activity you get? Would you prefer to be active in the way that dense neighborhoods seem to encourage — walking on the way to work, to do errands, or to attend events — rather than doing planned exercise? Could anything be done to make your neighborhood more activity-friendly? Leave a comment below!